Spontaneous Euphoria: On how I made a three-tiered cake by hand. Wednesday evening and I'm baking a cake. A five layered cake. But a small cake. 5 inches in diameter. It was my idea of a little masterpiece. Two chocolate layers sandwiched with a rose flavored layer in between and flanked with two vanilla cakes. 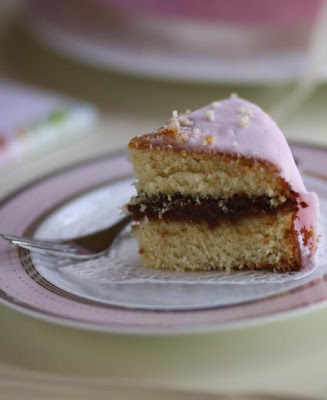 And iced with a pale pink frosting. And LOTS of Maltesers..
Let's just say the Maltesers never made it to the cake... because they ended up somewhere else. Right when I was creaming the butter for the frosting, my trusty 15 year old Kenwood mixer broke down. Somehow. The beaters won't beat.. and when I place it in flour or butter it makes an extremely strange wheezing sound. Sigh. I guess it's time to invest in a more high tech mixer. As a result, I couldn't beat the frosting that well AND I ran out of icing sugar.. 1 kg of it. Yep. So the cake never fully iced. But I am happy with it. Although it needed more icing to cover all the sides, it looked very neat. The flavours were the best part. And I'm extremely glad that I FINALLY attempted refrigerating a cake before and after crumbcoating it. It works like magic. Anyways, I cut the cake into a top three layers and a bottom two.. just to make it easier to cut.. and so that I feel less guilty when eating it. And ANYWAYS, next thing I knew it was Thursday and I was in the kitchen trying to make four vanilla cakes. Sixteen eggs, four cups of butter, eight cups of sugar. A health freak's worst nightmare. 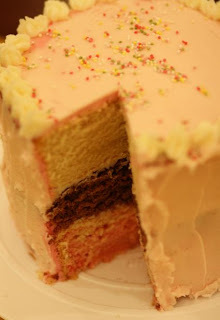 But I wanted to make a gradiented three layer cake. YES! But ohh, I forgot one thing... I didn't have a MIXER! What was I to do? Keep everything back in the fridge and abandoned my cakey dreams? NO. I'd mix it by hand of course... why, I'd get an arms workout! No need to head to the gym! I can work out in my kitchen! (And obviously have it come to zero benefit since I've started eating buttercream with my bare hands). And yes, I made the cakes by hands. Thank the Lord though that it was only two batches of the vanilla cake that I needed to fill all the tins I had prepared. So yes, no sixteen eggs, no four cups of butter, and no eight cups of sugar. 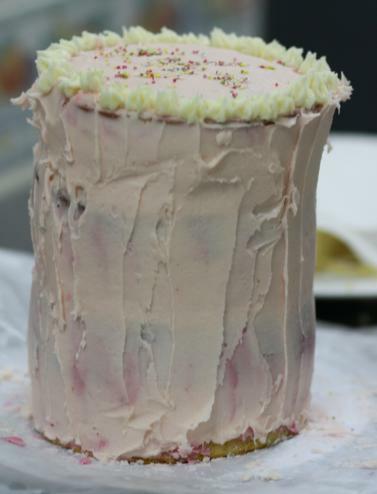 And so this was the initial idea for my cake (although don't you find that sometimes - or MOST times- the idea you started off with always gets changed a little? ): Three vanilla cakes, each of a different size, each halved and filled with chocolate buttercream and each covered with fondant. The largest one would be rose pink, the middle one pale pink, and the smallest one white. I'd tie a ribbon around each cake and make some lacey designs with royal icing. Most of that happened. Up until the royal icing, the cake was going just as I had planned. But then I had to make royal icing. And without a mixer, that didn't work. And so all my ideas of completely abandoning a mixer and reverting to the "authentic" and "rustic" way of baking were shelved. How would I whisk egg whites to firm peaks?! I hadn't even thought about that. I had been too caught up in my daydream of being Henry VIII's pastry chef for his wedding to his seventh wife. Yes, I realize that one must have one's head on one's shoulders, and one's feet on the ground. 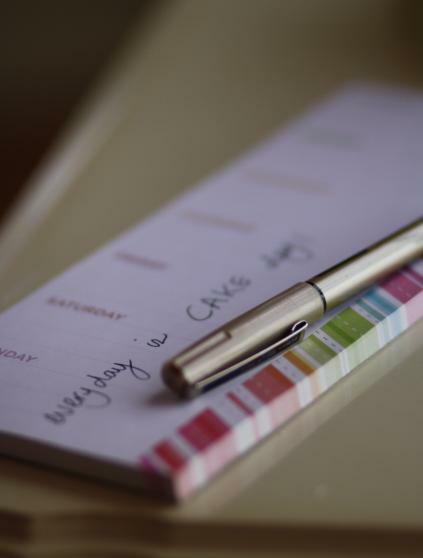 Yes, everyday IS cake day. So the royal icing was thick. And the cake was too narrow for lacey designs so I decided to make dots all around it. Thank God I had the good sense of first practicing with the royal icing on parchment paper. The mixer was sticking to the nozzle of the piping bag and not staying on the parchment paper/cake. (ooooh did I tell you that I finally conquered my piping bag fears? I no longer only use the mechanical kind!) :) So yes, the idea of dots were abandoned. But I am happy with the cake. -You don't have to have a mixer. You actually feel quite accomplished once you bake something with your bare hands (and maybe a spatula). -Never fear piping bags. And no matter how much of an expert you think you are with them, always practice the pattern you're aiming for first on some scrap baking paper. 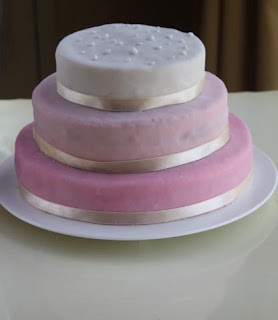 -Refrigerate cakes before coating with fondant. 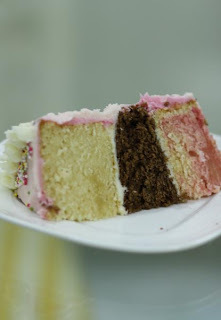 -When lining a cake with ribbon, melt some white chocolate and sporadically brush tiny amounts all around the edges of the cake, then line the ribbon around. 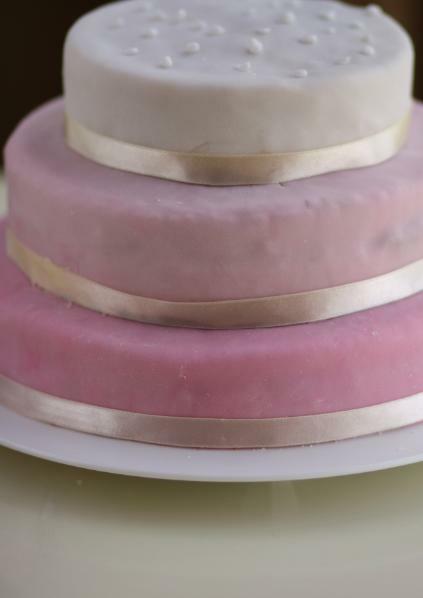 If making a tiered cake, start and finish the ends of the ribbon in a straight line. Everyday is indeed cake day! I'm so impressed that you made these cakes and more so by the fact you made them without a mixer! 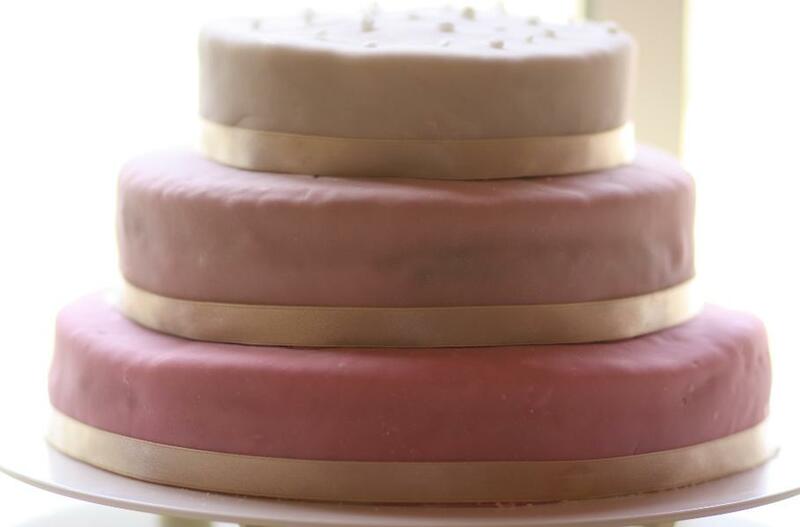 The 3 tiered cake would not look out of place in La Duree. oh wow sid!!! i AM impressed!!! this is way too much hard work for me... sure you're not practising for any kitchen Olympics??? Yes Sid like Rajani said are u sure u'r not practicing for the kitchen Olympics? Just amazing is all I can say :). Honored to know you. You deserve a trophy for your efforts! This is absolutely stunning! For you to have made this by hand is gob smacking.. wow! 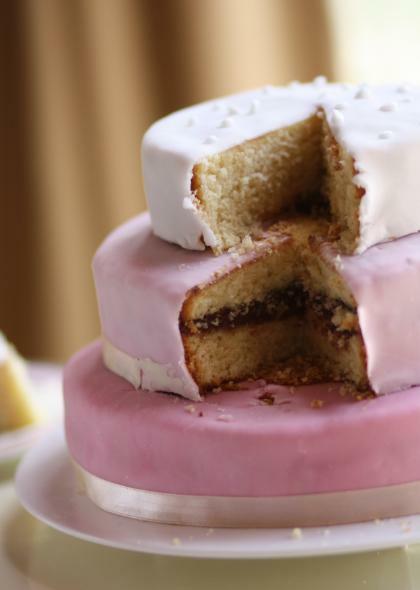 Hey, no matter what challenges you had with baking and icing, the cake looks very glamorous! I loved the simple decoration with different shades of pink. Very elegant, I'd say!